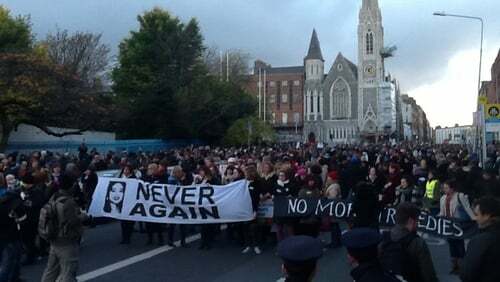 Thousands of people have attended rallies and vigils around the country in memory of Savita Halappanavar. The 31-year-old woman died following a miscarriage at University Hospital Galway last month. A rally in Dublin saw large crowds march from the Garden of Remembrance at Parnell Square to Leinster House, where a candlelit vigil and one minute silence was held. Gardaí said over 6,000 people took part in the march, however organisers said the attendance figure was significantly higher. Meanwhile, up to 1,000 people took part in a vigil for Mrs Halappanavar in Eyre Square in Galway, where a minute's silence was held in her memory at 5.20pm. Earlier about 60 members of the Indian community gathered outside University Hospital Galway and held two minutes of silent prayer for her. Events were also held in Ennis, Clonakility, Letterkenny, Kilkenny, Sligo, Limerick and Carlow while a vigil took place at the Irish embassy in London. Earlier, Minister of State at the Department of Health Kathleen Lynch said if the expert group on abortion recommends legislation, the Government will have to act on it. Arriving at the TEEU conference in Portlaoise, Ms Lynch said she would like to see the expert group report published as soon as possible. She said she had not seen the report but has discussed it with Minister for Health James Reilly. Ms Lynch said Minister Reilly had informed her that the process is now in train and the report has gone to the Taoiseach and the Tánaiste and Mr Reilly will then bring it to Cabinet. Meanwhile, gardaí have said they are assisting the Coroner in relation to the death of Savita Halappanavar. The Health Service Executive has said it has identified an international expert in obstetrics and gynaecology to join the Inquiry team reviewing her death. Full details of the HSE inquiry are to be announced over the coming days. The HSE has been in contact with legal representatives in Ireland who are acting on behalf of Mrs Halappanavar's husband, Praveen. The Executive said it is respecting his wishes in respect to channels of communications. University Hospital Galway said it had sent a letter of condolence to Mr Halappanavar following his wife's death.